Let us create a personalized calendar just for you and you special kitty (or kitties). You choose the color you wish your calendar to be (pastels: canary yellow, blue, green, or pink) and which photo(s) you wish to use on your calendar. 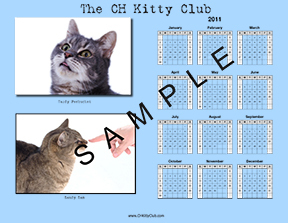 Send your photos to us, and we'll send you back a delightful calendar with which to always remember your special kitty and the CH Kitty Club. The calendar is 8.5"x11". Price: US$9.95 by PayPal. Click here to order your calendar today! We also would like to offer these wonderful CH Kitty pins when you make a donation to the CH Kitty Club. That helps us keep things rolling! It helps the newsletter and the website. Help us if you can; every little bit helps! Simply make a donation of at least $5.00 using the PayPal button at the top of the page, and you'll receive one of the buttons pictured below.